Today I want to share with you one of my biggest hobbies: jewellery design and manufacturing. I've realized that I've been posting a lot about the wedding stationary I love creating and some other graphic and craft stuff that I also like making but nothing about jewellery. Since I moved to South Africa almost 4 years ago that I've been enjoying and spending long hours sitting on a bench cutting, molding, soldering, polishing and finishing tiny little jewellery pieces made mainly of sterling silver but also other metals like gold or materials like wood, resin and perspex. 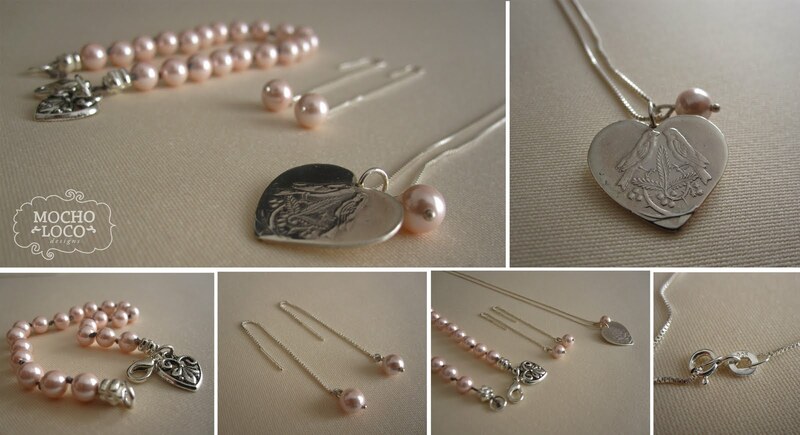 So after many requests, here is a little preview of my new Jewellery Collection: "Pearly Heart". I wanted to create a line of fine affordable jewellery that could be worn any time of the day, keeping a very fresh design... This line is very feminine, romantic and with a vintage flair. The necklace, earings and bracelet on the picture are made of 925 Sterling Silver and Pink Shell Pearls. Sigo el blog en silencio, pero me encantan cada una de tus creaciones!